When people can barely afford the minimum standards of living, they often forget about the “basic” needs and all they work for is survival. This is one of the famous stories that people always tell about developing countries and “villages” particularly. And indeed this is true, imagine a village where the nearest health centre is more than 3 kilometer away from the people, with only one primary school and limited access to clean/ safe water! A few weeks ago I was one of the panelists at the “Villages in Action” conference in Kikuube village located in Masindi, Uganda. This “first” ever village conference, was organized by Teddy Ruge of Project Diaspora. Almost 50% of all the conferences organized world-wide have the agenda of rural development. However, most of these conferences are hosted in big cities, 5-Star hotels and most of the participants (including panelists) are people who have very limited insight of rural livelihood. This means that the rural people are always under represented. 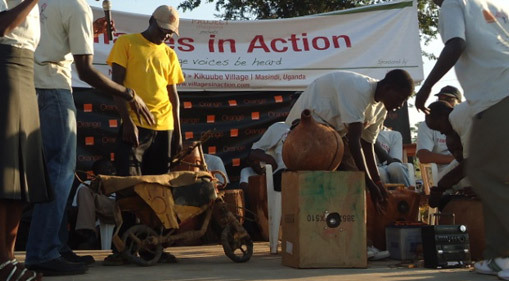 It is against the above (specific) reasons that I think the “Villages in Action” conference was a very relevant conference to the people of Kikuube village and Uganda at large. This conference took the microphones closer to the rural people (for their voices to be heard) and the cameras closer to their faces (for them to show the world the part of the villages like they have never seen). Orange Uganda (one of the Telecoms) generously sponsored the conference with a dedicated 17Mbs fast internet connection to enable a live video stream of the conference (first of the kind in Uganda). The young people of Kikuube village show-cased some of their technological innovations: * Radio made out of scrap radio part, * a woofer made out of a calabash and speakers cased in old jerry cans/ boxes and * a motorcycle made out of old plastic parts (and wood) tied together with banana fibers. So, without the above (among others) all their potential, good ideas and innovations always go unnoticed. This festive season I spent 7 days in my home village visiting family and monitor the work done by rural farmers under the Rural Farming for Development project. During my stay in the village, I got a chance to see some of the innovations in my villages. And this time, I took each one of them very seriously. Mr. Bugembe John is a local folk who has always blown people’s minds since I was a little boy because he is always trying to make something cool out of his ideas and scrap. When I visited my village a few years ago he was developing a Wind turbine which he used to generate some power to light his house for a while. This time I took the liberty to visit him and we had a very short but very momentous chat about locally-made technology and rural development. “The challenge here (in the village) is, I develop gadgets but I don’t have capital! So, usually it’s a very huge sacrifice for me to keep investing my small finances into all these ideas that I have to implement them”, Mr. Bugembe said with an unhappy face. “Recently I made a low-cost water pump; over here, let me show you”, he said with a happy face while walking me towards his little pig-sty where he keeps the water pump. 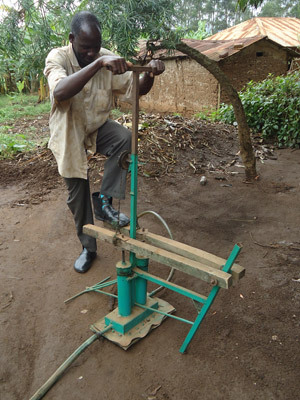 Mr. Bugembe is just one of the many African-Innovators who have the ability to develop technologies that are localized for the African communities, at cheap costs. But these innovators have a challenge of limited access to resources – both in terms of funds and information. I don’t know about everybody else, but I think Africa is at the point where we can make our own stuff, use it and share it with the world. The major advantage in this is people will get more localized technologies, easy to maintain and at cheap prices because things are made locally. The first step towards achieving this is to promote the rural innovations (and ideas) through the available media, provide mentorship to local innovators and make capital available to those who need it. DISCONNECTED: The Digital Divide in Apac District Exposed! When the local Television channels will not broadcast without a DSTV connection, no Broadband, and no radio – except for one Community Radio! What would do you do? Exposing the Digital Divide - Local TV NOT working, No Broadband, Just one Community Radio and Mobile Phones! This week I am in Apac District – Northern Uganda facilitating a Website training at Kubere Information Centre (KIC) a project of Women of Uganda Network (WOUGNET). Apac town is one of the disconnected towns in Uganda. People here; need DSTV (Dish Television) to watch local TV channels. There are no telephone lines – which means you cannot access broadband internet. They only have one community Radio (Radio Apac – 92.9) – this means that the rest of the local and international radio stations wont broadcast here. Life is very cheap and expensive here at the same time! Personally, I cannot imagine life without TV – I want to be able to watch the news on local Television when I can, I want to be able t listen to radio – both local and international (like BBC). Information and communication technology continues to become popular in many corners of the world, even in the developing countries. Now, the Digital Divide is wider and more visible than ever! This is not my first time in Apac but this time I have learned something new and rather very inconveniencing. But life here continues. Through out the day, I see people walking in and out of this information to read the daily newspaper, agriculture information material and to access the internet. Its times like this that I get to appreciate the power of a mobile phone. My cellphone is working very well, and thats why I can use my Mobile Internet Dongle to access the internet via GPRS. The internet is pretty slow and unstable but at least thats the reason I am still connected with my friends in Kampala and all around the world. And Radio Apac ( the community radio) is really doing wonders here. Its the only working/ broadcasting FM radio station in this town. Everybody tunes into it. Last night, I tuned in to Radio Apac using my radio-enables mobile-phone. They use a mix of English and Luo (the native language here), playing some decent music and actually download a couple of podcast from Voice of America radio (VOA) and play them back for the listeners here in Apac! Our stake holders should do better than this. The government should invest more funds in development of community radios, information centres (Telecentres) and infrastructure to facilitate communication not just in “big cities” – but also down to the grassroots. Provide skills NOT just finished technologies. Most of the current problems in Africa are being solve by the few “experts”. On top of being expensive, it takes them a bit of time to do the necessary research and studies before they come to a conclusion. In my opinion, it would be a lot easy if the local people are given the skills to investigate solutions to the problems affecting them. This makes them feel more involved hence taking up the obligation to find solutions to their own problems and “make it happen”/ innovate. Its the same with the technologies. Once people get the technologies, they don’t feel the urge to work hard or improve on the current technologies or even look for cheaper solutions. But when the solution to a problems affecting a wider community comes as a result of skill the locals have earned. They get more involved in applying the required skills – more innovative too!! Give skills not technology.